This post is sponsored by Romabio. All opinions are 100% my own. I remember from the moment we first walked up those steps to our house’s little stoop that I wanted to limewash this entire brick exterior. Robert admitted to me later that he had the exact same thought. Great minds think alike… or maybe minds who have been married for a while. She’s a charmer, this little colonial of ours, but I know she would be even prettier all dressed in white. But because we like texture, we still want a bit of the raw brick to show. So limewash is the answer. 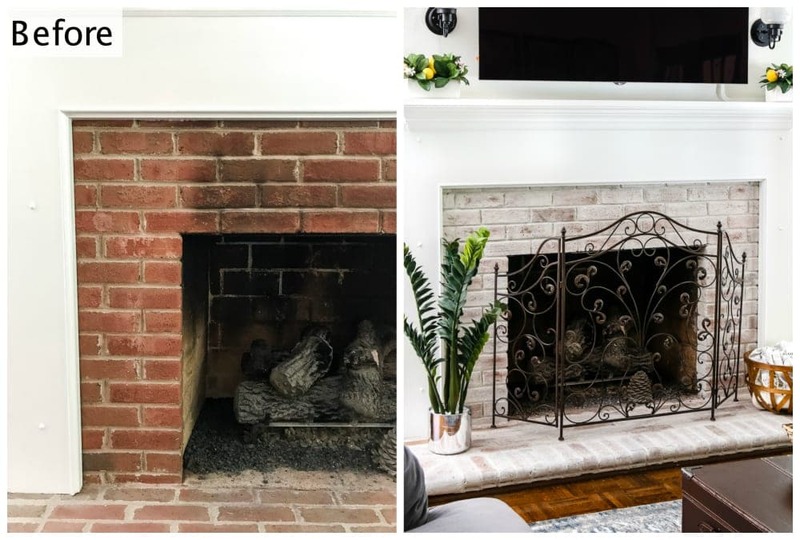 Remember back when I shared our fireplace makeover that featured the same orange-y style of brick? I spiffed it up with Romabio Classico Limewash, and I was instantly in love. 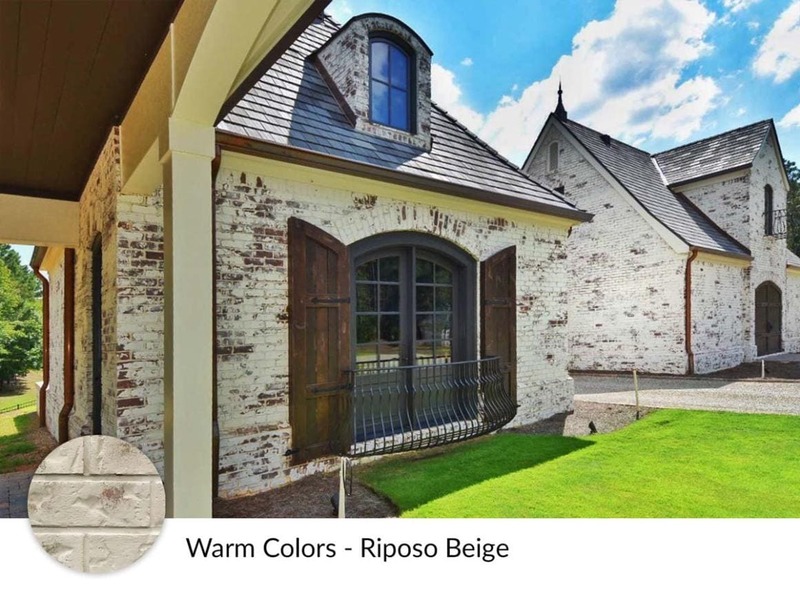 Romabio Classico Limewash is made of real slaked-lime from Italy that goes on in one coat and is much easier to use than German Smear or mortar wash. It’s designed for exteriors, so it doesn’t flake or peel off so it continues to have an authentic European look. I loved working with this limewash so much that I reached out to Romabio to ask if they would be willing to help a girl out with the prospects of a house exterior makeover, and lo and behold they’ll be coming out in November to make it happen! I cannot WAIT to see it all happen in person, and I’ll be sure to include y’all every step of the way on my Instagram Stories as we make progress. So now the question is what color to pick… what limewash would you choose? Bianco White- a true, bright white with no yellow undertones. Avorio White- a neutral white that works well with either cool or warm tones on trim and roofs. They have 4 more colors too, but these were my top 3. Black- A classic black and white would pop so beautifully. These are some of the Behr paint colors I’m considering that are great for exteriors, if you’re thinking of spiffing up your exterior too. Cool Gray– The softer looks of a cool gray feels so welcoming. Warm Gray- A more yellowy gray would be so lovely too. Navy Blue- I love this punch of color that still behaves like a neutral. French Blue- This color is not so much a neutral but look how gorgeous! 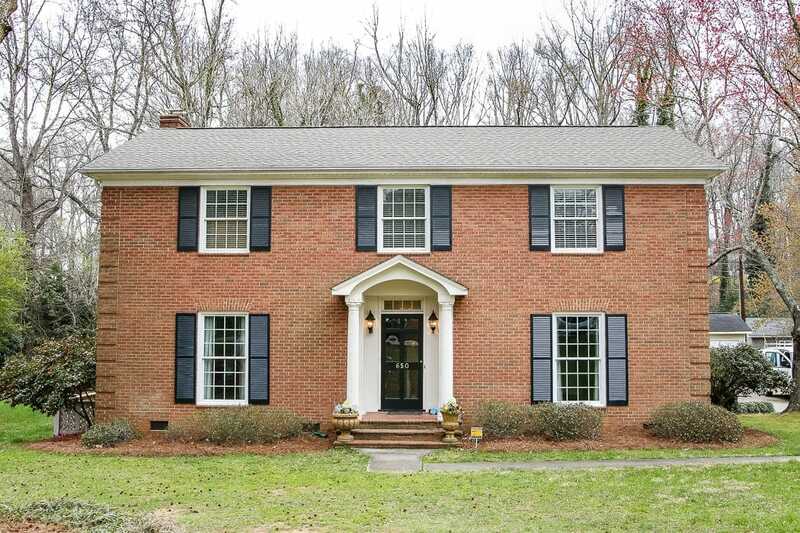 That color on the shutters coupled with a rustic wood front door would look so chic. What would you pick? White limewash and black shutters? Warm gray limewash and French blue shutters? Warm beige limewash and warm gray shutters? Too. many. choices. Ohmigosh!! This is SO EXCITING! Any option would look amazing. If I had to choose, just one, I love Avorio White with the Navy Blue shutters— or maybe the French Blue. Ahhh!!! Can’t wait to see what you guys choose! I like this look also. I love this! I really like the Avorio White with the French Blue or Navy Blue. It’s going to beautiful no matter what. Good luck! My first thought is the cool white bc you are starting with orange/red brick. A yellow based white on top may not give you the look you desire. A Krio white with French blue! Love it! I Love this!!! I like the Avorio White with the Black Shutters……. Its just so classic and will never go out of style. And maybe a pop of color on the front door…….. So excited to see this in action!! I would say Avorio White and Black 🙂 Navy shutters is a close second for me too. Ahhhh, can’t wait to see the results! The change is going to look fabulous no matter what color you choose. What a huge difference it is going to make. I am looking forward to seeing the reveal. So exciting!! I personally like the warm wash. Any of the lime washes will look fabulous and I like the classic black or navy blue shutters. I cannot wait to see the transformation! Definitely the Avorio White with Black shutters. Totally classic. The house is going to be so pretty! No matter what color you and hubby choose it will be beautiful! Wanted to let you know that I bought a new light fixture after your post yesterday. Yep! The power of suggestion. Hubby is gifting me part of my Christmas early. Thanks so much for your post. Yaaaay! What a sweet hubby. 🙂 So glad it helped! I like the Avorio White with either black shutters or the yellowy-gray shutters. It’s going to look amazing when it’s finished. Congratulations on such an exciting project! So excited for y’all! Navy blue shutters with Avoiro white has my vote for sure! 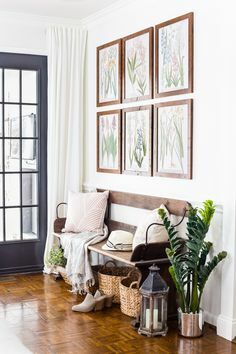 I think the Avorio White allows for you to make changes to the shutters/trim down the line if you so choose since it’s much more of a neutral. Also, the french blue seems to tie in the farmhouse feel that you are so good at! Avorio white for the limewash, and navy blue for the shutters. I love a great shiny navy blue! I like the mixed whitewash the best.. and for shutters.. warm grey or French blue make a nice change from the black that so many use. I vote for Avorio White with black shutters & a red door! Wow! They all look good! My favorite is the avorio white with black shutters. So classy and timeless! The Avorio White for sure because you could go so many way with the accent colors. I think the French Blue are beautiful, I just wonder if they would look too washed out, but I would certainly try it first, and the navy as second choice, and I agree with the timeless look of classic black to round out the top three! So jealous! We have a brick front that I’ve dreamed of doing this! I love the Avorio white with black shutters (adding shutter hardware would look amazing (like picture #6). Maybe consider painting your porch & columns in bright white. Can’t wait to see the final results! I love whitewashed brick! My preference is the Avario White (softer) with warm gray or navy shutters. It’ll be an amazing transformation! Avorio White & Black shutters for sure!!! For shutters, one of the grays or the French blue. I tend to like the softer look which those shutter colors give the house. It will be an amazing g transformation! Hello! You will have a wonderful transformation when it is done! My vote is this. 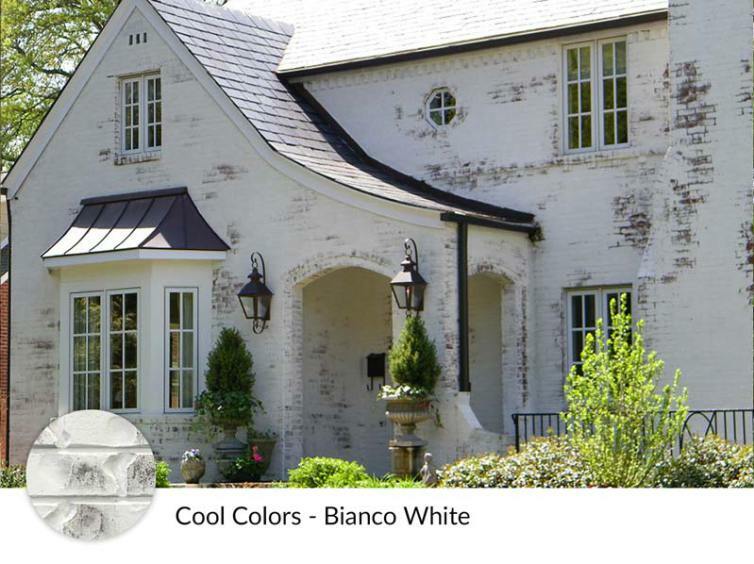 Avorio White – I like the neutral tone of it and down the road if you change out paint for shutters and doors it will go with whatever you decide after this go around. Navy Blue for shutters – it’s different and you can work with a lot of door colors and porch décor. I know I sound practical but I believe in getting the best bang for the buck along with stylish! Can’t wait to see! I love the Avorio White with black or navy shutters… the cool white is too white – almost looks painted. French Blue trim absolutely without a doubt!! That’s the very first color I planned to suggest… long before I realized that you were going to give us choices. Congrats on your stunningly gorgeous home. To accent your gray comp roof, Avorio White with gray or French blue shutters! Does lime wash work on exterior stone too or just flat brick? Yes! You can lime wash exterior stone too. 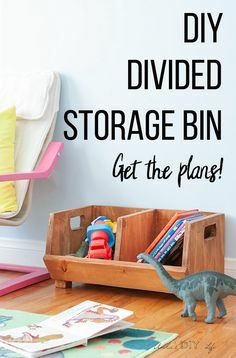 Here’s an example of it, if that helps: https://www.pinterest.com/pin/288863763593791624/ I love that it still shows texture, unlike painting it does. My fav is Avorio White. You can’t go wrong with classic black shutters, but I REALLY like the navy! Can’t wait to see the final pics! Avorio white and French blue! I also like the amount of limewash on the pic with the blue shutters, more of the brick shows through, but not too much. Your house will be transformed! Avorio white and navy blue shutters, for sure! This will give you a whole new look. You already have black shutters. If you’re anything like me, you’re already making the change so change it all girlfriend! I love the Avorio White for the limewash and one of the cool grays for the shutters! I love the classic black shutters, the navy shutters and the French blue….but the light gray seemed to “feel” right to me. With your light gray roof, it will look great! Whatever you choose will be beautiful…I really like your style of decorating. Can’t wait to see the transformation of your beautiful brick lady! I know whatever you and Robert pick is going to be lovely and will make the fireplace look even better. 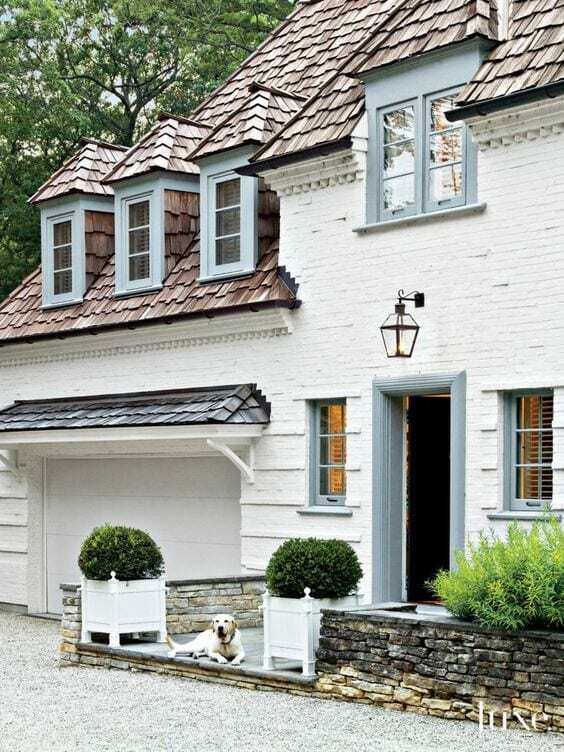 I really like the Mixed Colors – Avorio White for the brick and the French blue for the shutters. I like the Avorio white with black shutters. It is just such a class combination. Can’t wait to see the transformation and I know whatever you pick will be stunning! Avorio White and Black Shutters! I’m all about choices that are timeless. I vote Avorio White with black shutters. I love your home! Limewashed House: Less is more! I love limewash…but only in smaller doses. The smaller home looks lovely, but the larger homes, to me, just look worn out. Especially those with the more muted color shutters. If your home is large, like the first few samples you provided, I would paint it solid white, fern, or gray. Then paint a few random bricks a SLIGHTLY different tone of the same color. If your home is smaller, or has a Craftsmanish style…go for it. Shutters: if your home is large and you do the limewash…go with Black shutters. They will offer the best, and cleanest, contrast to the color of brick that is showing through. Note that several of the homes with colored shutters were solid white…except the small one. Which was my favorite. There you go. Best wishes!!! You are so right about solid and random bricks in darker tone. I am into the shabby look but not so much in a large home. I knew something was wrong with the pictures, but I couldn’t say it as well as you did? Avorio white with French blue, unless you plan to replace your roof to a darker color, then I would go with navy. Grey is too predictable & black is a little harsh with the light roof. FOR THe exterior color, I love the mixed color. If your style or preference changes (warm or cool tones), this will be easiest to work with—not to mention it’s just so beautiful!!! 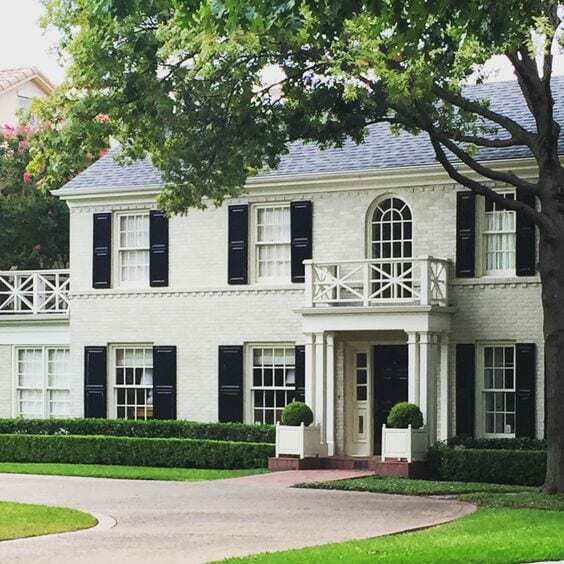 I love the blue(French and navy) for the shutters, but black is also beautiful—not to mention classic and timeless!! I think it depends on if you want a more subdued look, go with French blue, if you want something with a pop, do navy! Those three are my favorites. Avorio and Warm Gray. What an exiting transformation. This is going to be beautiful!! I would say the aviation white with the French blue or navy. Makes me wish for a brick house to update. ? Avorio white Black shutters. Clasic. Exciting looking forward to watching. Thank you for including us. Avorio White with a dark gray shutter. The navy and blues are not my thing, and I don’t think would look as good on your style of home. How exciting though for such a drastic change. Avorio white with black shutters. Nice and classic! Love it! Arvorio White is gorgeous. The shudders are the hard one as they need to not only fit with your style but also match with your roof. All your options will look great but I think I would grab some sample paints of your favorites, paint large pieces of cardboard/boxes and then prop them up next to your house once it’s painted. we want to paint the exterior of our home, too, and know how daunting such a project can be. I love the Bianco white but any of them look good. I do prefer the warmer wood look or the black. Colors are great but black or gray is classic and never out of style. Can’t wait to see it!! Good luck! Everyone has opinions but the only one that truly matters is YOURS! You know what you like the minute you see it. Go with that! I have a hard time choosing my decor so it just sits for long periods of time. The more choices I have the worse I get. Go with your gut! This will look beautiful! I think the Avorio White is the better option, and I am partial to the black shutters for the classic traditional look. Plus going with these two options gives you just about any choice when it comes to the front door paint color! And if you ever get tired of the front door color that is much easier to change than shutters/window colors. Best Luck on deciding!! Can’t wait to see the after pictures. P.S. Hope you don’t have an HOA to contend with for the decisions. Use the same color as you did inside on that brick. You already love the results. The shutters are great! You won’t go wrong with any color but I especially like the black or navy blues. Avorio White with Black shutters….French Blue a close second. Very Charming! Avario White and French Blue! Gorgeous! They are all very pretty combinations, but I still love the classic look of the white and black! They black shutters just stand out beautifully and would look gorgeous on your colonial!! I would consider painting it solid white, fern, or gray. Then paint a few random bricks a SLIGHTLY different tone of the same color. Black shutters. They will offer the best, and cleanest, contrast to the color of brick that is showing through. Note that several of the homes with colored shutters were solid white…except the small one. Which was my favorite. I would go with Avorio White. As far as the shutters go – of your choices I would go with the cool grey. However, if it were my house – I would do white shutters and then add window boxes filled with seasonal flowers and / or greenery. Avorio White with classic black shutters is my vote 🙂 although I am loving on the navy too! Either would be beautiful! Oh. My. Gosh. It looks fantastic! I am now even more jealous of you and your style. I didn’t think it was possible! I love the Avorio White!! Any shutters would probably looks fantastic! Maybe grey?! Our first home was a gorgeous dark brick Dutch farm house that we later lime washed similarly to Bianco white. Ten years later we painted the brick a rich cool deep taupe, added a deep multi-tonal cool charcoal 5 ply architectural shingle that I LOVED and deep charcoal trim with matching seamless gutters. We had shutters before we started and actually wound up loving the simplicity without them after. I am an interior/exterior designer (in my former career). My suggestion would be two fold. Firstly, it is hard for me to tell the tone of the light roof you have, so my FIRST suggestion is stay cool or warm with the tone of the roof. Second, because the roof is light, I think if you go TOO dark with the shutters they will become SO focal it will look like a girl with WAY too much drawn on eyebrow (like we are seeing so much of right now) and all you see when you loo at her face is the brows. That said, my votes would be thus: If your roof is a cool tone, go with the Bianco white and the cool gray or cool French Blue (whichever tickles you more ), and if the roof is a warm tone, I would go with the Avorio white and the warm Gray or warm French Blue. You don’t want the warm roof to fight a cool exterior palette or vice-versa because you’ll never be happy without the harmony. Just my thoughts. Loving all your work so far and bringing back all the memories of when I was younger, newly married, and had tons of DIY energy and ideas. You inspire me to do more! Wow, this comment makes great sense! P.S. Not paying any attention to the roof (which is a mistake), my vote was for the warm Avorio white and either warm gray or black shutters. Maybe French blue on the door, BTW, I love your blog. It is by far my favorite, and the most helpful of all the many blogs out there. Thank you SO much, Jennifer! So glad to hear it’s been helpful! So true, Lisa! That’s a great analogy about the brows and shutters. 😉 Thanks for your thorough input! Your first home sounds gorgeous! I would love to eventually do architectural shingles. So much pretty texture. Absolutely Avorio white with black shutters! Beautiful! I love the French Blue! And initially I thought the Bianco, but now I’m not sure…I think a softer look would be better. My fav is Avorio White with the Black Shutters. Good luck!!! Avorio White, Warm Grey or Navy. You have such wonderful taste in decorating, whatever choice you pick will be the right one. Looks like the shutters are all you have to think about.. Black is classic, but don’t you want to put your own spin on this? Will love whatever you decide. and French Blue…so very Chateau Lauren! And much more current than high contrast colors. Can’t wait to see your end product…try not to let the liming look too uniform…better to look naturally weathered. You inspire us all to keep on pushing! Rebecca T.
First off your home is beautiful! I have a white with black colonial as well. It’s very stately. I feel with your bubbly personality and being a young couple I would choose for your home the grey wash with blue shutters. You can’t go wrong with any of the choices. Looking forward to seeing what you decide on! Eyes of Texas are Upon You! Whaaaat – No aqua shutter choice? I can’t believe it! JK. 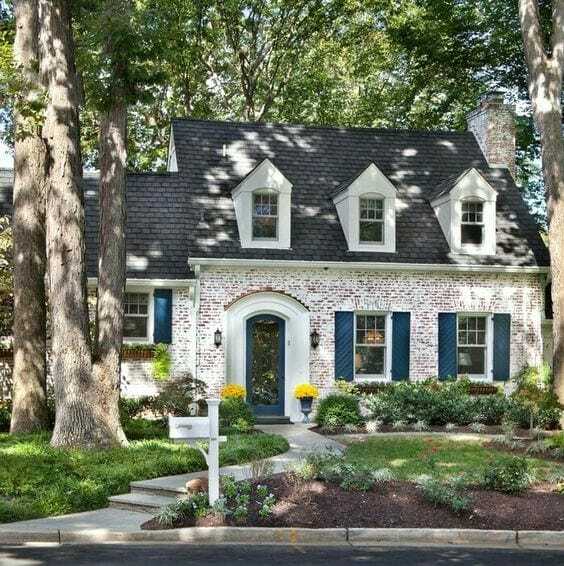 I love the Bianco White with the French Blue shutters. You have your work cut out for you. One think I know for sure. NO matter what you choose, it will be gorg! I know, right? 😉 I’ve drifted from the aqua in this house, for some reason. Not sure why. Thank you, Cindy! I like the Avario white. Not sure about the shutters and door. I think I would leave them black and the time to get the feel for what would look best on your house. I think you will have to see the finished brick before you can decide for sure. Love the house by the way. Definitely Avario White with Black shutters. Totally classic. Get your color from the door and plants. A close second for shutters is Navy blue. I would go even darker with it than the one you show. They would look black at a glance, but a gorgeous navy when the sun hits them. I really love this, it will be gorgeous. Avorio white with crisp black shutters, beautiful! It’s calling your name! Hi Lauren! Wow, my heart when pitter patter on such a big project, decision and impact! I would choose the navy blue shutters and the white limewash. Of course, that example has a dark roof that pulls it all together. If you two already have ideas of what your future roof will look like(if you will need to replace) that would sure help to decide. How exciting and really gutsy to do this, I look forward to it! Oops I didn’t say which white, the Bianco white, true bright white! So excited for your family’s new adventure and God bless you for having the courage to let us all chime in. So here goes, while I like the Avorio with black shutters idea I’d prefer to see such a large area not so busy and just paint it. But…have you ever considered german schmere? 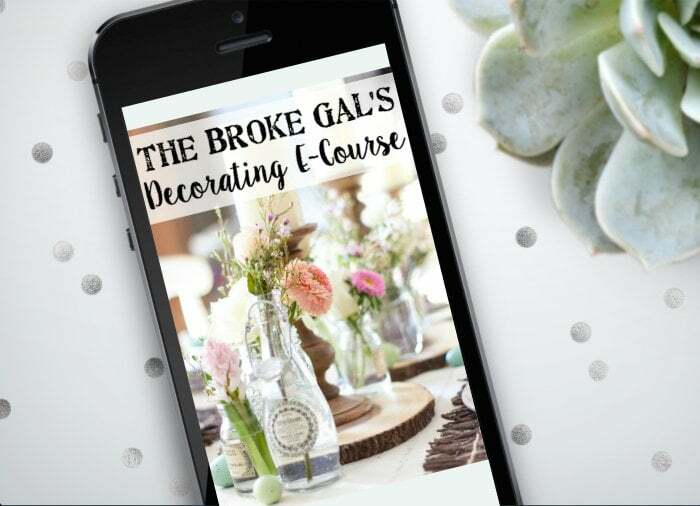 Joanna Gaines did one and it really played well with her customers french theme. Blessings! Personally, as a lover of all things blue, I prefer the Avorio/black combo Romabio provided for your virtual makeover. It really showcases the classic lines of your home and looks stately. As someone mentioned previously, color on the door would be a fun way to introduce a different color. In addition, the high contrast on the outside sets the stage for the high contrast on the interior, which looks fabulous. Lauren – I am going against what everyone else seems to like but I would go with the Riposo Beige for the limewash and Black or Warm Grey (possibly but can’t picture it) for the shutters. Really enjoy your blog. I so love this look and am excited for you! I would choose the Avorio white and black shutters. I think the color you have painted your interior wood work might be a great choice. I can’t wait to see the end result! Thank you for letting us be involved. This is so exciting. Can’t wait to see what you choose. My number 1 choice for the brick color is the Riposo Beige, and number 2 brick color is Avorio White. But I would want to see both next to the shutter color, which I love, the Navy Blue. Whichever brick lime wash out of the 2 looks best with the Navy Blue is what I would go with. I also have a brick house in a SMALL town. Only a couple of the other brick homes in my area have done the lime wash, but the BIG city closest to us have quite a few charming homes with the lime wash. I don’t know if I am brave enough to be the first one on my block to take the lime wash plunge. I think you should go classic white wash brick – mainlybecause this colour will always be in style. The beige brick wash is going to make your house look dirty from the get-go; and i know how much you like that ‘clean look’ . For the shutters-definitely Black (to tie ito your black interior doors). This is a classic look you wont have to re-do in 5 years … it will always look current. Avorio white with black shutters! Take into consideration your roof color. A black roof makes black shutters pop and tie everything together. If you are keeping your lighter colored roof I would go with lighter shutters and a paint to blend with both. Look at the example of the house with the black roof and see what I mean. The entire package is beautiful. I think the Avario white with black shutters or a very dark grey is very classic and would fit your house perfect. I love the warm lime wash as well, but think the shutters should be stained with that one. It seemed like you were leaning more towards painting the shutters. Avoiro White with either warm gray or black shutters. I love the feel of the warm gray shutters, but black shutters are so classy and would allow you to change your front door color whenever you feel like you need a change. Have fun deciding! I really like the Avoria White with either the Navy or Pewter shutters. Can’t wait to see the new look. Whatever you choose will be fantastic. Absolutely the Avario white and the Black shutters. The black will pop and look so crisp and classic against the white brick, which will be perfect for your classic style of house. The exterior of our house us similar to yours, although ours is frame, but the windows, their placement, and the front porch is very much like yours! I love this style! If you decide to paint your front door, a deep, rich red would be very welcoming and look great against the black and white. Have fun and good luck! Avorio White with Black shutters. Classic and timeless. Avoiro and Black it’s classic! I like the Avorio White with the navy blue shutters. So cute! Can’t wait to see how it turns out! Avoiro white with warm gray shutters. We just remodeled an apartment and used Behrman Elephant Grey and loved the tone it was soooo warm and neutral. You could then go with a black door for a classic look or something bright and colorful. It will be a huge undertaking but will definitely a game changer. OH BEAUTIFUL!!! I vote Avorio White and black but oh how lovely navy shutters would be!!! What color will the door be? I love the Avorio white for the wash. For the trim, I would choose the black. First, for its classic look, but (and you will definitely think I’m a weirdo) also because of Christmas! Navy is so patriotic when you add red to the scheme – which is great for the summer patriotic holidays; but a little too patriotic for the Christmas look! Like I said, I’m a little weird, but you surely can’t go wrong with the black! I really like the Avorio White also . I like the softer look of the cool gray shutter, the one you have pictured with the copper overhang above the door (LOVE that too), but I have cracked gray pepper shutters and front door on my house and like those too. I was going to go black with mine but just didn’t like the stark contrast and when I saw the cracked pepper knew that was it. Your fireplace is beautiful so why not get as close to that as possible. The black shutters are so neutral and timeless. If your roofline is visible, then I would match the shutters that. Not a fan of the limewash, but if you’re for sure doing that, I’d go for the navy trim. I will definitely change the entire look of your house. Can’t wait to see what you choose. I really like the brick just like it is now. It looks so classic! Everyone has black shutters! The navy or French blue would pop. I’m neutral on the lime wash. You’re more the expert here! Can’t wait to see what you choose! I think the Avorio white with black shutters would be a timeless look. The limewashing is a great choice for your brick makeover! Can’t wait to see your big reveal ? Lauren, everything you do is beautiful, but I myself am partial to the Avorio White, and Navy or French Blue, we all will Love whatever you decide, can’t wait to see the results, Oh Happy Day? Like many of the others, It’s got to be Avorio White. I do like the black shutters. Have fun changing the look. Avorio white for sure and (I can’t believe I’m saying this because I love dark shades! ), French blue. It would be stunning! Good luck choosing. Trim can always be changed in a few years so worry more about the base- just like getting the bones right in a room! ? I guess I’m with the majority – Avorio White! For the shutters either French blue or classic black. Can’t wait to see it finished! My choice would be Avorio White with Navy Blue Shutters. However, whatever you decide will be beautiful! Love everything you have done so far! Bianco White with Cool Gray shutters!!! The avorio white and the French blue would be soooo pretty, fresh and cheery! I would do riposo beige or Bianco white with French blue shutters. I think it will just look dreamy! I agree with Kate (above); cool Bianco white with cool grey shutters is a winner for me, and has a touch of the classical Nordic style. Absolutely gorgeous and whilst contemporary, won’t date either. So you won’t feel forced to redecorate in three years’ time! Good luck! Sherwin Williams Tricorn Black for trim would be great with the limewash! to have a very low pitch. I would like to see another colorized photo with the Avorio white and black and charcoal shutters. Personal opinion, I am sick of seeing aqua anything. What great options! Avorio white with black or navy would be my choice. I don’t think you can go far wrong with any. Plus a pop of colour in the front door? Good luck!!!! It’s going to look gorgeous! My eye was drawn to the Avorio White and the French Blue shutters. I think Avorio White limewash with the shutters a darker grey from your shingles, and the front door painted a darker grey or black to match your scroll lights. Paint your urns a cool blue/grey or…l also have a decorating question at your convenience. Thanx! Avorio white with black shutters is my favorite combination. 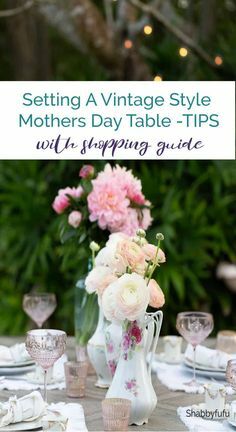 I think it would look very classic, and everything else you do with your yard, etc will compliment it well! Definitely the Avorio!! For the shutters, either warm grey or french blue! I like the avorio white with with black or navy blue shutters. I love the classic look! I think I like the avorio wash best, and thr French blue shutters would be amazing! 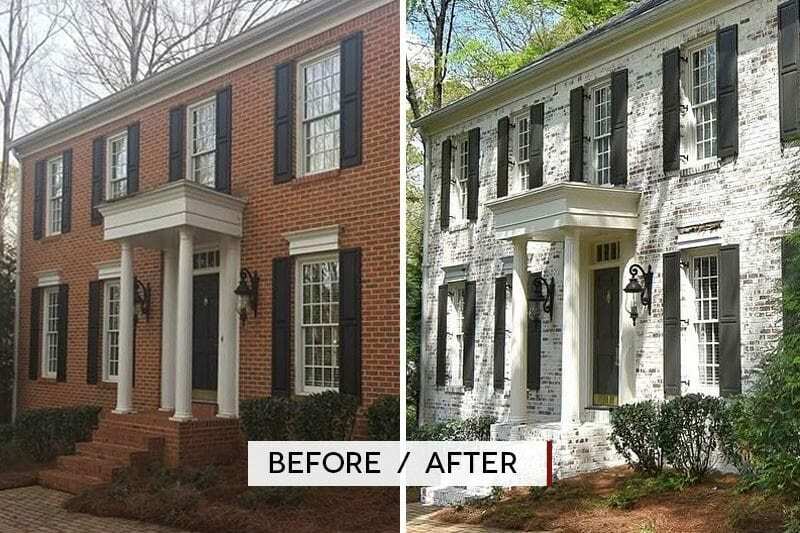 I’m not sure about the lime wash colors for the house….they look very similar in the pictures, but I do like the gray tones for the shutters. I think the black is a bit too stark with the white. I can’t wait to see which options you choose and how it turns out! Avorio white with black shutters….it”s a classic! Based on the pictures, I vote for Avorio white. I crossed the beige color off immediately. The Avorio white appears softer, less harsh than the other white. Shutter color vote was more difficult! In the end, I’d vote for cool grey. You have a tough decision ahead of you! Hope all the input helps! Avorio White with Black shutters! Classic and clean that won’t go out of style! No matter what you choose, it will be beautiful! Avorio white with the navy shutters is my personal preference. But really all the colors you chose would be nice. The mixed colour with either navy or black. Avorio White with French Blue Shutters! And the wood door! Oh, yes! These colors will go perfectly with the roof. Can’t wait to see the finish! Lauren I went to Pinterest and looked at all your colors …much easier than Behr..put them in a folder and I vote hands down for dark pewter ..I think it will be amazing with Avorio White limewash. Thats my vote !!! ? I really like the Avorio white and love both blues for the shutters. I am partial to blues so of course, that would be my pick. I can’t wait to see the finished product. Avorio White with the black shutters is a classic look! Avorio White and black shutters. That’s classic and would also tie in with your interior colors. I can’t tell what undertone you have in your roofing, but if he has any pinky undertones than stay away from the white with yellow undertones. Avorio White with Navy shutters! Love! I really like the avorio white with black shutters! But I feel sure whatever you chose will be lovely! Avorio white and I’m leaning to dark navy shutters. Can’t wait to see it finished. Avorio White with black shutters! Absolutely classic. Can’t be beat! It’s all beautiful! I like the Avorio White, not as stark as the brighter white, and not as yellow based as the beige. The blue shutters, so dreamy!!! It’s really up to you, and you know what you have fabulous taste so whatever you choose it’s going to be amazing! The shutter color kind of depends on the limewash color. A cooler color on the shutters probably wouldn’t go well with a warmer whitewash and vice versa. And both choices would depend on just how much of the original brick you plan to let peek through. In the pictures, your brick seems to be on the orangey-red side. A lot of brick showing through wouldn’t look good with the French Blue or the grays. My personal choice would be the cool white limewash, with barely any brick showing. The navy or cool gray shutters would look amazing with that. But if you went with the black shutters or (my favorite) a super-dark charcoal gray, you could do a bright pop of a door color. And the door color would be easy to change on down the road when you felt like a little makeover. Avorio White and Black Shutters. Love Avorio White and Warm Gray or Black Shutters. Very classy look. I vote for Avorio White with one of the grays for the shutters–such a timeless look! 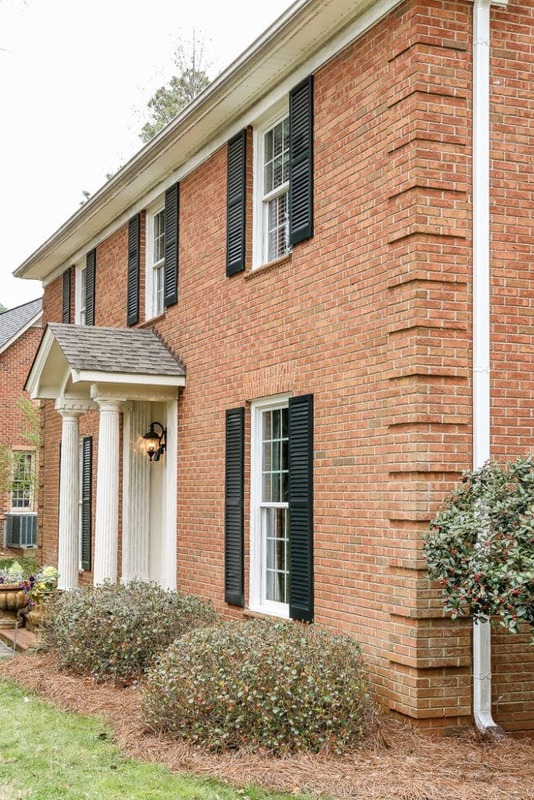 I am totally out numbered but I really really like the Riposo Beige…with Navy shutters! I think bright white is being sooo over done right now! I guess I don’t want things to be the same as everyone else has. White is harsh on the eyes and it is hard to see anything else when white grabs your attention…no one will notice your yard, architectural features or the personality you put into the décor! They will see and remember only the bright white. Black shutters are also being over done so although for contrast I think you need a dark color I would use any of the others…but my favorite is Navy!!! I think the Avorio White for the house color, and you know you want the French blue shutters. ?It’s your color! I would choose Avorio, since it is a neutral base, and a similar color for trim and soffits. For the shutters, I’d split the difference between the grey and black, with a deep charcoal. A red, orange, or mustard door would zing! Goodness gracious, girl. I am soooo excited and know your house is going to look “fantabulous”! I love the Avorio White with either the Black or French Blue Shutters. 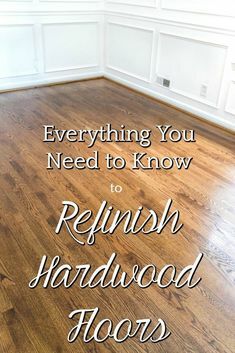 I CANNOT wait to see the finished product.I know it is going to be amazing, just like the inside of your home. Turning cartwheels over here in Virginia for you. Well, more like skipping down the steps to steal a bit of Halloween chocolate. Shhhhh! Don’t tell. Seriously, cannot wait to see it. AvorionWhite with Black shutters. Timeless and classic choice. Have you maybe considered a different style of shutter? Not sure of whitewash, they all seem great but I vote for the NAVY shutters! Timeless but not boring. sorry Lauren but to me the houses done in “wash” look like they are worn out, shabby looking. 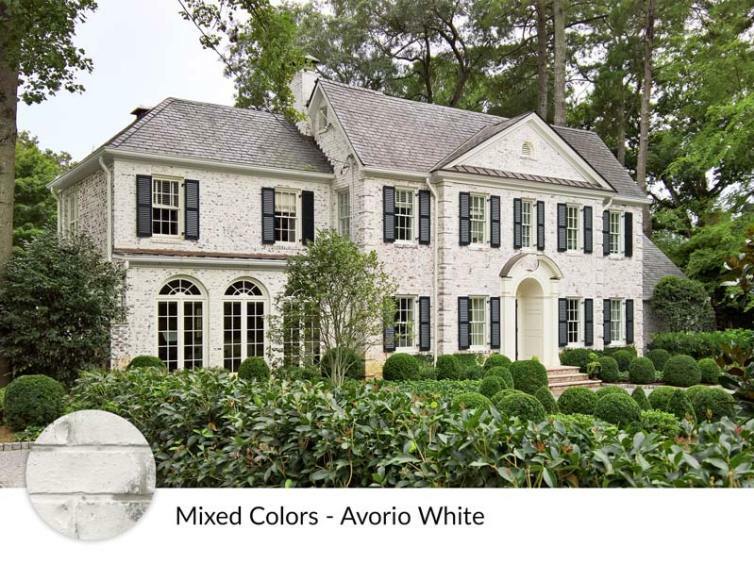 So hard to choose, but – Avorio White with black or gray shutters. Your style is fantastic, whatever you choose is going to be perfect! Wow!! It’s going to look amazing no matter which you choose. I like Avorio white and a gray shutter. That’s so cool they are coming from Atlanta? I live in Plaza-Midwood, Charlotte. Just had our house painted in the spring and we used SW shoji white. Just love a white house especially your limewash. Avario White looks so pretty! I like the French blue (it reminds me of the gorgeous Hill Country Hyatt, minus the Texasness ;)) or the warm gray for shutters. Im sure whatever you decide will look amazing! It is up to you. But I’d want to say to them. I don’t want it to turn pink like my fireplace did. See the house with the navy blue shutters. It is not pink but is a nice covering of the old bricks. I’d want to tell them that. I don’t feel like you are a beige person inside your house. You’ve done back accents. Do you want blue shutters that are similar to black but gives a unique look to the exterior? So my choice is just like that house with navy shutters ? Ahh!! I can’t wait to see it!! I love the Avorio White. That is a great mix of the whites. I also have to say I love the contrast of a black shutter against the white! Definitely a pop! 🙂 I am so excited to see what you choose. I love the Avorio White and the Dark Gray shutters. That look you have chosen is so beautiful!! I wish I could do that to my red brick. I doubt my Subdivision committee would approve it. They don’t like anything hardly. Everything you do is amazing so i’m sure it will turn out perfect! I personally love the Avorio White. For shutters I can’t decide between the gray or Navy. Such a hard decision! I don’t envy you! I love that you will be limewashing the exterior. My pick would be Avorio White with the Black Shutters and the Black trim would be true to the interior of the home and I would do the pop of color on the door. I do love the French Blue, however I believe the black is the way to go. 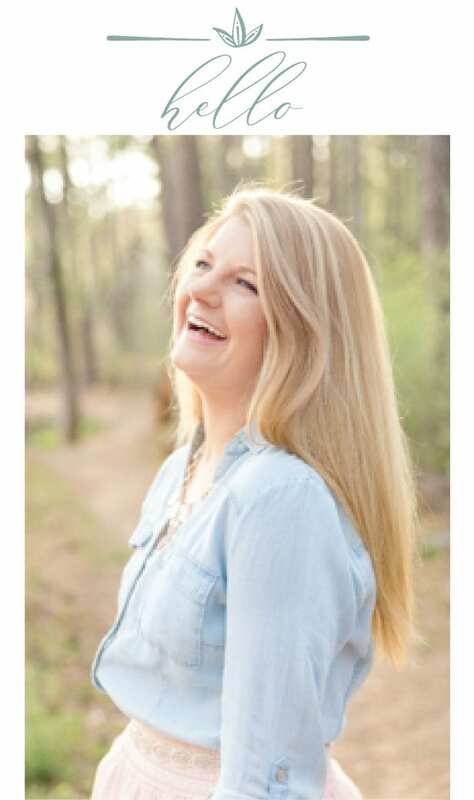 Lauren, thank you for your great blog. It’s the only one I follow regularly, and I always look forward to reading your posts. My favorite so far has been the messy house tour! Keep the posts and ideas coming! Avorio with cool gray shutters. I like the avorio wash and think you can’t go wrong with it. I love classic black shutters but also really like the navy. If you want something different and a little more warm, the French blue would be beautiful too. 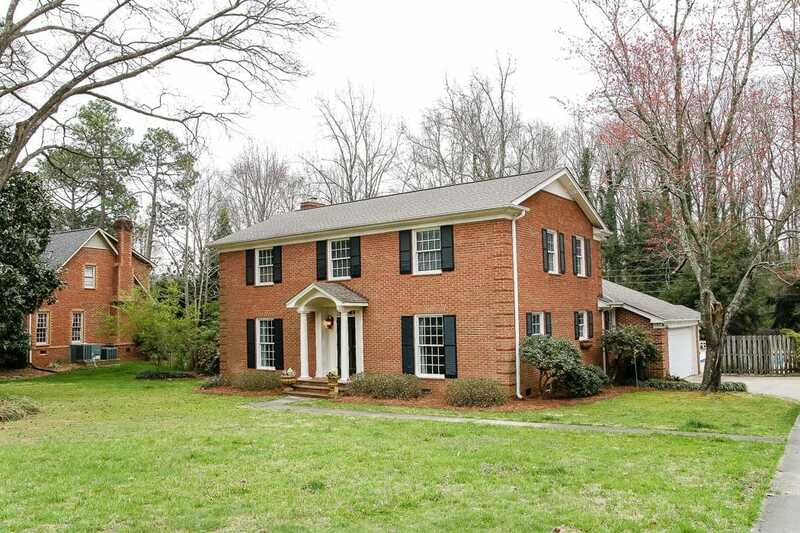 This little colonial of yours is a true beauty! You’ve said she kinda steers your updates so go with your gut on this one. ? Definitely the Avorio hands down my favorite choice for the exterior. The shutters are a bit harder as I’m torn between going with the beautiful, classic black or a little bit of whimsy with the French blue. Either way, it’s a win win, as they will both look stunning! I’d go with the Brite white and French blue. I just think those colors would play well with each other. Oh and I’d paint the door too in a darker blue for a true pop of appeal. But I tend to love a mix of color. I prefer the navy shutters and love the look of the Cape Cod in your photos. Avorio white, hands down. For shutters, black is my preference for your home, but they are all beautiful. You have an existing neutral roof. The Avorio White would probably be best with that–any color you later choose for shutters would also coordinate with it. I would also opt for a darker warmed tone shutter to keep her “stately” classic look amidst the neighborhood, without going towards the somewhat trendy look of the light French blue etc. What a wonderful opportunity for you ! So very exciting, have fun making your “dream home” come true ~! It will be exciting to watch the transition, can’t wait ! The white and French blue shutters. Gorgeous!! oh man…i must be the only one who loves it as is! lol I guess if anything, I’d do all white, and i mean completely cover it. I always think when the old brick shows through it simply looks like peeled paint that needs to be re painted..but that’s just me. I’m sure their technique is spot on and they’ll do a great job. Lucky you guys. 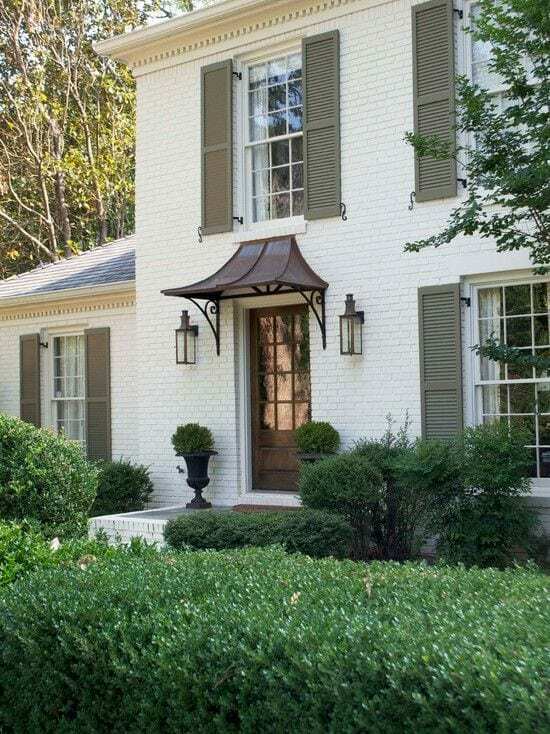 I’d do white with black shutters, and a pop of color on the front door. I really like he bianco white with either the black or French blue shutters. The black shutters is my first choice for you, since you already have the charcoal window and door trim (great job, by the way). You can bring color to the landscape with plants and flowers. The blue reminds me of your last fabulously transformed farmhouse. I’m not as thrilled with the yellow tones and lighter greys. Though I’m sure, with your track record, with any of these combinations you and your husband with make it look wonderful! My vote is avorio white and French blue. But whatever you pick will be amazing as always. ? Behr Black Suede and white limewash. Classic plus ur roof looks dark grey or black. If it’s more grey cracked pepper. I agree with white. I think tan may go more orange. White and black are classic that won’t go out of style. I can’t believe how many people are choosing the Avorio White! Great minds think alike!!! Shuttters would be Navy Blue or secondly Black. Can’t wait to see what you choose and the final result! It will be smashing!!!! Avorio white and navy. At Christmas, decorate w silver and pale blue and it won’t be “patriotic” looking. I would even consider painting the roof over the front door a light blue to represent the sky (this , I think, was popular in the south ) and I think it’s making a comeback. Can’t wait to see the ‘after’!! I like the Avorio White with black or warm grey shutters. Either is a classic look. Also, I would consider your roofing. I think the door would look good either black or grey, but to tie the roof in, maybe do the grey on the door, with the black shutters. Can you tell I don’t stray too far away from classic, neutral looks?! You can always add a wreath or flowers or some front porch/door step accessories for a punch of color. Like many of the other responders, I can’t wait to see it too! Definitely the Avorio White with dark gray shutters. Eye stopper! White with black shutters, it’s a classic for a reason. Your choices for accents such as front door, landscaping and hardware are limitless and can be changed as styles and tastes change. I’m afraid with the French blue you will look at in a few years and think so 2017. I like the Avorio with the French blue shutters. So pretty! Avorio white with black shutters. Classic. Timeless. Just like your home. Such beautiful options! But I think that the Avorio White is a homerun! With the color of your roof, I would choose either black or navy blue shutters. Regardless of whichever you choose, it will be gorgeous! Avorio white with navy blue shutters! Hi Lauren- I haven’t read all of the comments, but it seems quite a few people are liking the idea of a white house with blue trim. I personally like the exterior of a house to be the introduction of the interior colours. I would choose the warm white, so when the sun isn’t shining on it, the house is still warm and welcoming, and then I would put the dark pewter on your shutters. You can do a coloured door easily to whatever is trending if you desired the blue, but having colour on the door alone, makes it easy to change to whatever colour accents are your whim at the time. You have wonderful timeless taste that is also fun and inspiring. I’m sure whatever you and your husband choose will be perfect. I bought a brick colonial a year ago and knew I wanted to do this too, but I am totally clueless so I’m so excited that you are doing it and I can learn from your experience! I really like the Avorio white and navy shutters. I am planning to do my shutters a very dark, charcoal blue. Can’t wait to see how it goes! Well I am going to be the odd ball!!! I love the abortion white too but the light blue shudders would be so southern with the stained door!!!! That porch ceiling of course would have to be light blue as well. Can’t wait to see what color you choose!!! Make that not spell checked! Aborio white aaahhhhhhhhhhh!!!! When I first started reading I knew I would be all about the black shutters and then I saw the French blue and fell in love. But is there a bad choice here really? Can’t wait to see…. 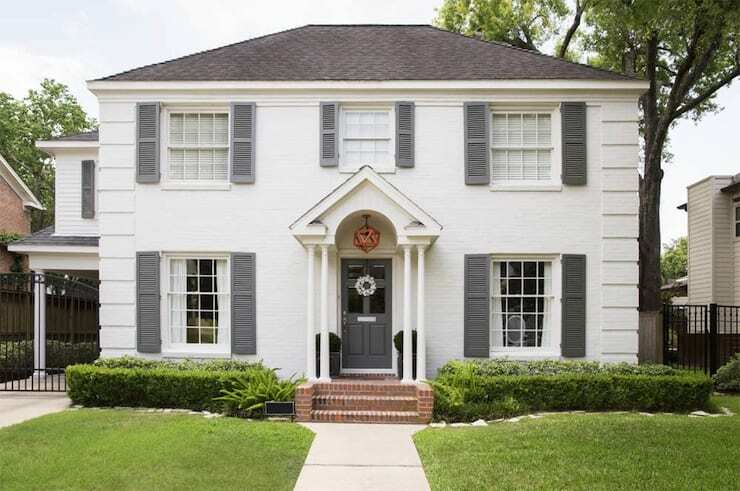 I’m a little late to the party, but I love Avorio White with either Black or Navy Blue shutters and then one of the gray colors on the rest of your trim. I also like the French blue, but if you use that, I’d pair it with the warmer Riposo Beige. I like Avorio white with black shutters. Not shiny like in the picture, though. Whatever you choose will be beautiful just like the rest of your home. I cannot wait to see the finished product. I like the Avorio or Risposo. I also like either the Navy Blue shutters or Warm Grey. Good luck! Very exciting. Shutter color – I would go with the French blue (or, my favorite, a sage green). And I would paint the front door to match it. 😉 Not a big fan of greys or black. Limewash – If you’re going to do this I would go with the Avorio White. It seems more neutral – not cool, not warm – which will give you more options if you decide you want to change the shutter color in the future. 😉 To be honest, I like natural brick. Did you ever finish the Limewash? Yes, Laura. It is finally done! Stay tuned for the reveal soon. OMGosh! How do you decide? I wanted to do this to my house and my daughter pitched a fit. Its dark red brick. I think it would really freshen and make the house feel so different and new. The brick colors dont look so different to me, but I LOVE the French blue shutters and wooden door OR black shutters and black or red door. Those items you can change if you paint those colors and dont like it. Can’t wait to see the REVEAL! I want to do this too!!!!! I know youll make the right choice. You always do. BTW, please gift me the chest in your entryway. I LOVE that thing! Ill even spring for the shipping!! LOL! I am late to this party as I missed your post when it first went up. Absolutely love the whitewash look you did on your fireplace and the re-do photo provided from Romabio is stunning! I prefer the Avorio white for its “natural – color achieved over time” look. The white/whites are too stark and the beige tones makes the brick look as if it needs washing. I like the black shutters (perhaps the color you used on your interior doors and windows). The French blues would work for the door. The classic look of the black shutters is timeless and combined with the limewash is striking in a refined way. As large and flat (except for the corners) that your house is, I think the limewash will give you a very distinctive look and much more pleasing than a solid paint coverage. Doors are easy to repaint as your accent color, but shutters and exterior color is for the long term and give you great freedom for accents and plantings. Can hardly wait to see the finished project. 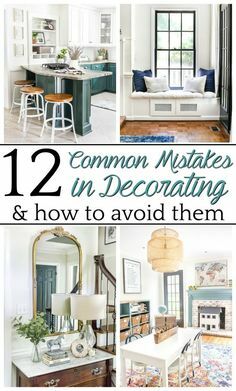 I love everything you have done in your house and the change in the interior colors from what was “in” when the house was built to the light, neutral palette is stunning. I have a white brick ranch that’s getting a whole new remodel. New porch across the front, some stone incorporated pillars, roof , ect… Would it work on white brick??? I know it’s prettier with the contrast of darker brick but I would rather white wash or stain instead of paint because I’ve heard these procedures work and keep longer??? Thank you!! Absolutely!! At the end of the day it is all about personal preference. But, the whitewash on white brick will totally work.